The minute I walked up to The Magnum, I could tell I was walking up to a casual spot that people from the neighborhood stopped by to eat at on their way home from work. It felt like a restaurant for regulars. I liked that feeling. They’ve done a good job of mixing up the casual feeling of a bar with the more upscale feeling of a restaurant all in one space. Classy yet comfortable, is how I would describe the atmosphere. I loved that I could order off both the restaurant and the bar menu. They had a lot of Scottish specialties mixed in with seafood and burgers on the menu. I had studied the menu ever since being asked to review The Magnum, but with so many choices, deciding what to order wasn’t easy. 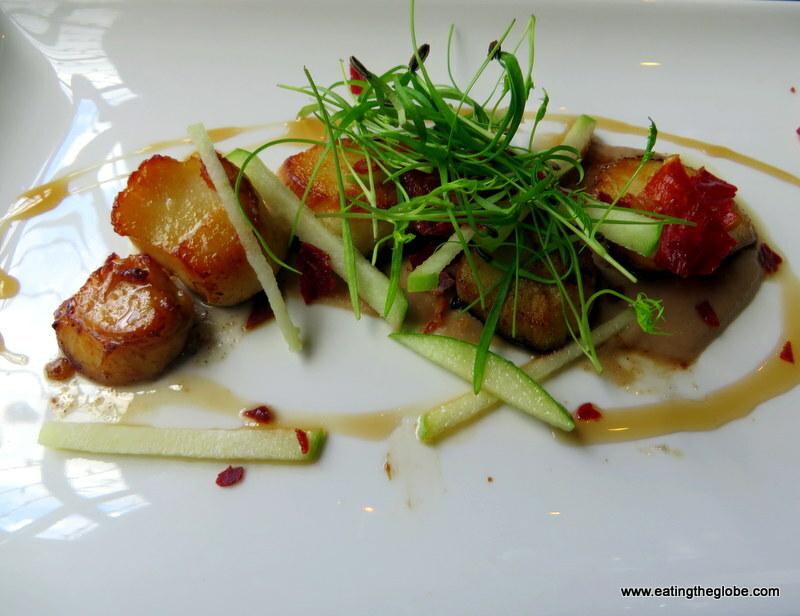 For a starter, I chose the scallops with green apples and a maple syrup glaze. There was also a chestnut purée and crispy prosciutto on the plate. The scallops were cooked perfectly which is hard to do. I also loved the combination of the seafood with the apples and maple syrup. These flavors were made for each other. This was a great way to start my meal. Other starter options were a goat cheese mousse, duck salad with rhubarb purée, or the traditional cullen skink. It was definitely a hard decision! 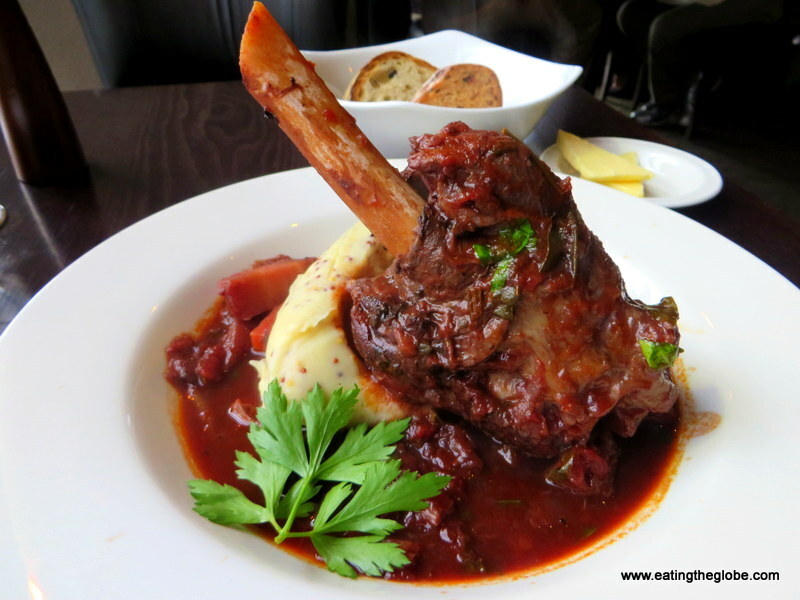 I had the slow-braised lamb shank with a mustard mash for my main course. It could have been braised at a lower temperature for a bit longer, as it was a bit dry and not as tender as I like, but the flavor was great. The table next to me raved about their fish and chips. The Magnum also served things like sea bass with surf clams, a rib eye steak, and guinea fowl. Dessert couldn’t have been better. 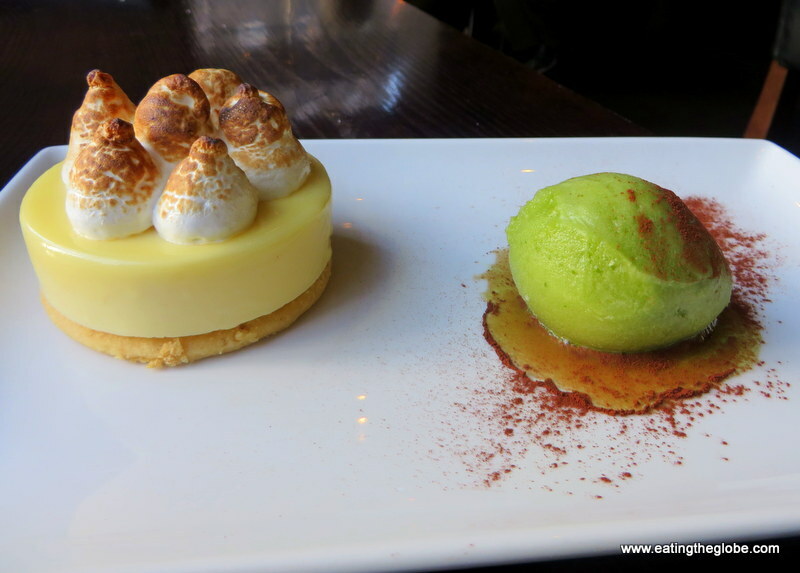 The lemon meringue shortbread tart combined with the homemade basil sorbet perfectly. I ended dinner with a flat white which was perfectly made and made me just want to linger in the comfortable space and watch the evening fade into night. 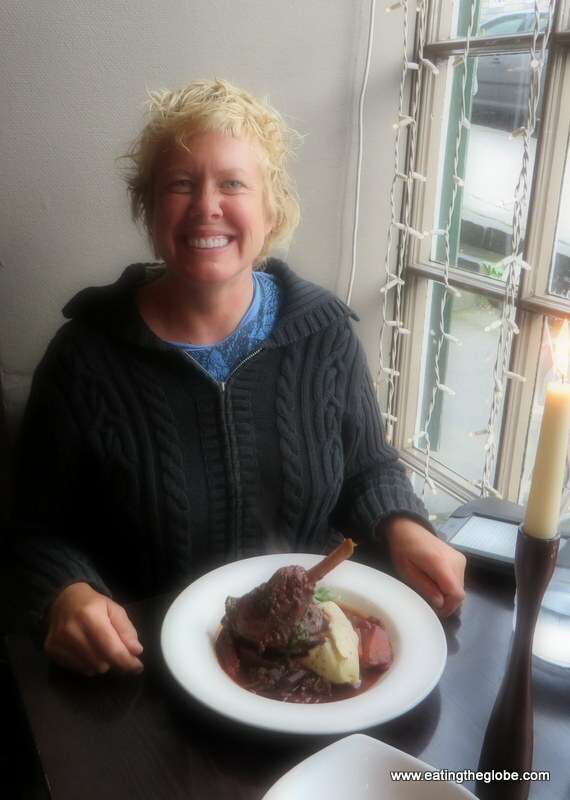 Service at The Magnum was perfect, and I adored sitting next to the large window that looked out on the street. The wood interior gives a feeling of comfort, but there is also an outdoor eating area for warmer weather. If you are looking for a cozy restaurant in which to dine with the locals, then this is your spot. 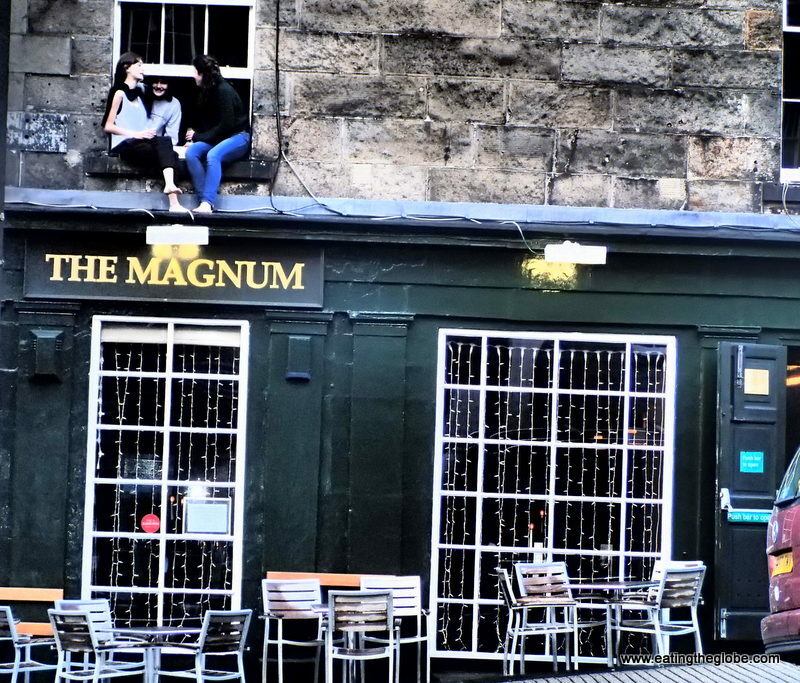 4 Responses to "Edinburgh Restaurants: The Magnum Bar And Restaurant"
Yum. Really looks off the charts! 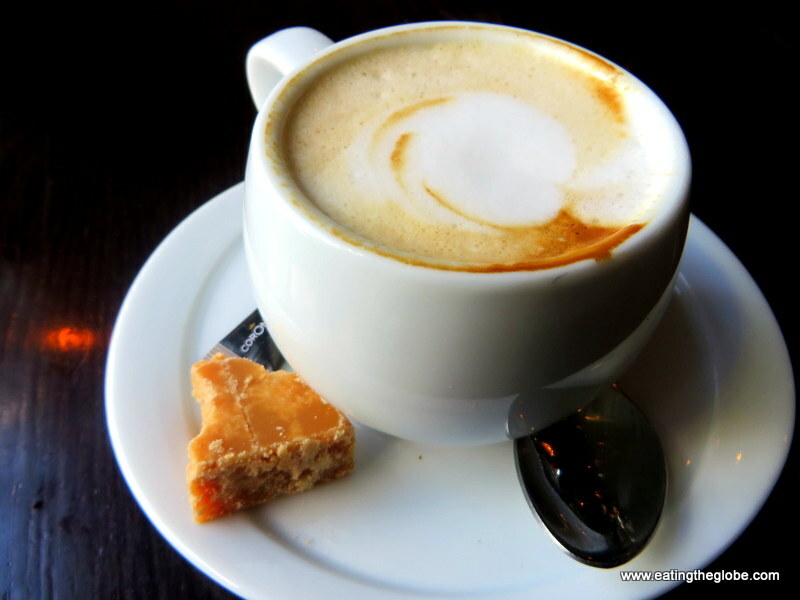 I also can appreciate a well made flat white. I had one just yesterday, and it really made my afternoon.